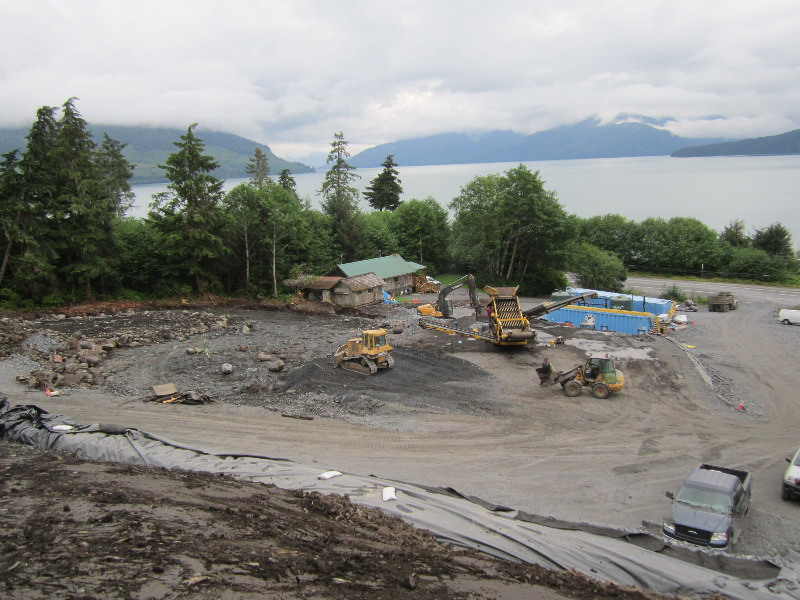 NRC was selected by the Alaska Department of Environmental Conservation (ADEC) to perform site remediation of Wrangell Junkyard, a former salvage yard facility. The purpose of the project was to provide complete site cleanup and restoration by removing all contaminated soil and other hazardous materials down to a level meeting residential land use cleanup standards established by the ADEC. The primary contaminant of concern was lead resulting from former crushing and smelting operations. The site consisted of uneven terrain (18-degree slope) and very wet swampy soil conditions due to the location being within a boreal rainforest averaging over 80” of rain a year, and drainage that runs off the mountain. Site preparation tasks included the installation of erosion and sedimentation controls and various staging areas, on-site water treatment system, impacted soil, and containerized waste consolidation areas. The site required the diversion of surface and subsurface water to allow for precise excavation to remove soil containing a variety of contaminants including lead and petroleum hydrocarbons. Strategies were developed, designed, approved and implemented to properly manage drainage water and prevent it from exiting the site and into the Zimovia Straight during the project. Woody debris, tires, lead acid batteries, automotive engines and engine parts, oil filters, corrugated metal roofing, rims, 55-gallon drums (empty or containing POL), and other assorted metal debris were located throughout the soil mix and made up approximately 10-15% of the excavated material. Excavated soils were passed through the on-site screen plant and mechanically treated with ECOBOND®. Screening graded the material into three piles: material over 6” diameter, to be used on-site as fill; woody debris to be burned off-site; and clean metal debris to be hauled to the Wrangell Landfill. Other metal debris and segregated POL contaminated soils were shipped as non-regulated waste or used on-site as fill material. 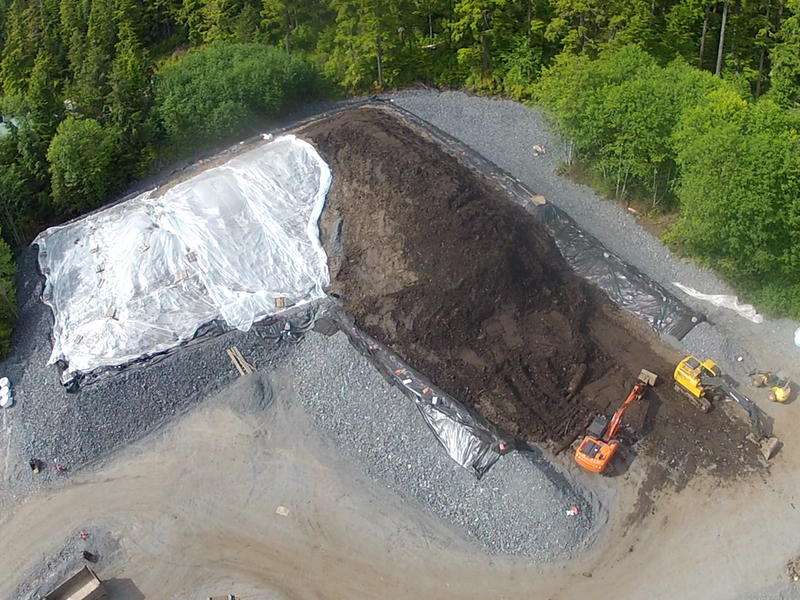 All treated soil was placed in a lined and covered storage stockpile for future disposal. The initial site cleanup plan targeted approximately 4,000 cubic yards (CY) of soil requiring treatment for lead contamination ranging up to 137,000 ppm. However, as initial phases of the project progressed, NITON XRF field screening samples consistently showed lead contamination extending throughout surface soils to the depth of the glacial till layer. Blue clay layer was found at depths ranging from 2 to 7.5 feet with an average of 3.5 feet in depth, increasing the volume of contaminated soils requiring treatment and disposal to ~20,000 CY. The process of soil excavation, on-site treatment, packaging, transportation and disposal of impacted soil made up the majority of the remedial efforts and activities for the project. Dewatering activities, sampling support, backfilling and site restoration activities were performed prior to demobilization. 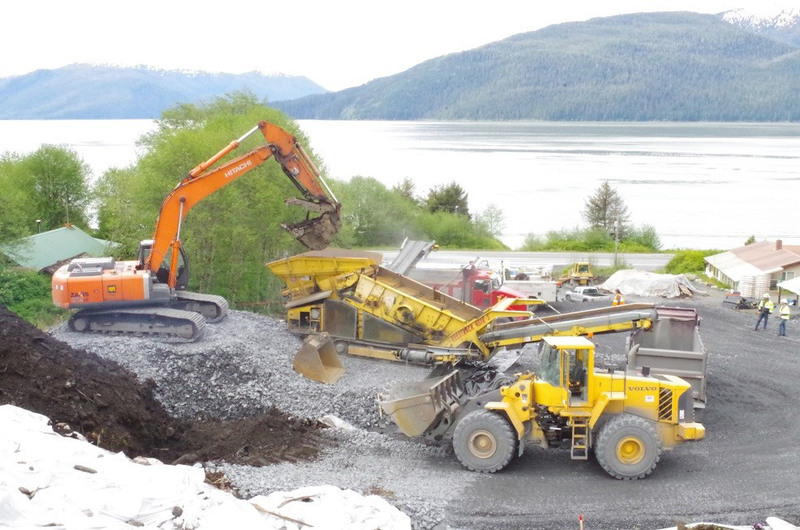 NRC managed the transportation of materials and wastes from the Port of Wrangell, and ensured the proper end treatment and disposal of all contaminated soil, liquids, and other hazardous/contaminated materials encountered during the project. The restoration efforts restored the site with clean, compacted fill following receipt of clean closure samples analysis. Site surveying; clearing of trees and vegetation. Implementation of Storm Water Pollution Prevention Plan (SWPPP). Construction of rock access road through the site. Construction of rock pad for laydown area, screen plan & water treatment system. Collection and consolidation of solid waste, including tires, lumber, concrete, and stumps. Collection of surface and subsurface lead acid batteries, battery shards and lead plates for disposal as Hazardous Waste. Excavation and lead stabilization of over 20,000 CY of lead and petroleum contaminated surface material and soils. Drums identified and over-packed for shipping & disposal. Complete site restoration including adjacent property cleanup.